Here are some snazzy birthday facts about 27th of October 1951 that no one tells you about. Don’t wait a minute longer and jump in using the content links below. Average read time of 10 minutes. Enjoy! What day was my birthday Oct 27, 1951? October 27, 1951 was a Saturday and it was the 300th day of the year 1951. It was the 43rd Saturday of that year. The next time you can reuse your old 1951 calendar will be in 2029. Both calendars will be exactly the same! This is assuming you are not interested in the dates for Easter and other irregular holidays that are based on a lunisolar calendar. There are 191 days left before your next birthday. You will be 68 years old when that day comes. There have been 24,646 days from the day you were born up to today. If you’ve been sleeping 8 hours daily since birth, then you have slept a total of 8,215 days or 22.49 years. You spent 33% of your life sleeping. Since night and day always follow each other, there were precisely 834 full moons after you were born up to this day. How many of them did you see? The next full moon that you can see will be on April 19 at 11:14:00 GMT – Friday. Fun stat: Your first one billion seconds (1,000,000,000) happened sometime on July 5, 1983. If a dog named Chin-Chin - a Rat Terrier breed, was born on the same date as you then it will be 288 dog years old today. A dog’s first human year is equal to 15 dog years. Dogs age differently depending on breed and size. When you reach the age of 6 Chin-Chin will be 40 dog years old. From that point forward a small-sized dog like Chin-Chin will age 4 dog years for every human year. The British lose their first battleship of World War I: The British super-dreadnought battleship HMS Audacious (23,400 tons), is sunk off Tory Island, north-west of Ireland, by a minefield laid by the armed German merchant-cruiser Berlin.The loss was kept an official secret in Britain until 14 November 1918 (3 days after the end of the war). The sinking was witnessed and photographed by passengers on RMS Olympic sister ship of RMS Titanic. Léopold Sédar Senghor founds the Senegalese Democratic Bloc. British nuclear test Totem 2 is carried out at Emu Field, South Australia. Saint Vincent and the Grenadines gains its independence from the United Kingdom. What does my birthday October 27, 1951 mean? 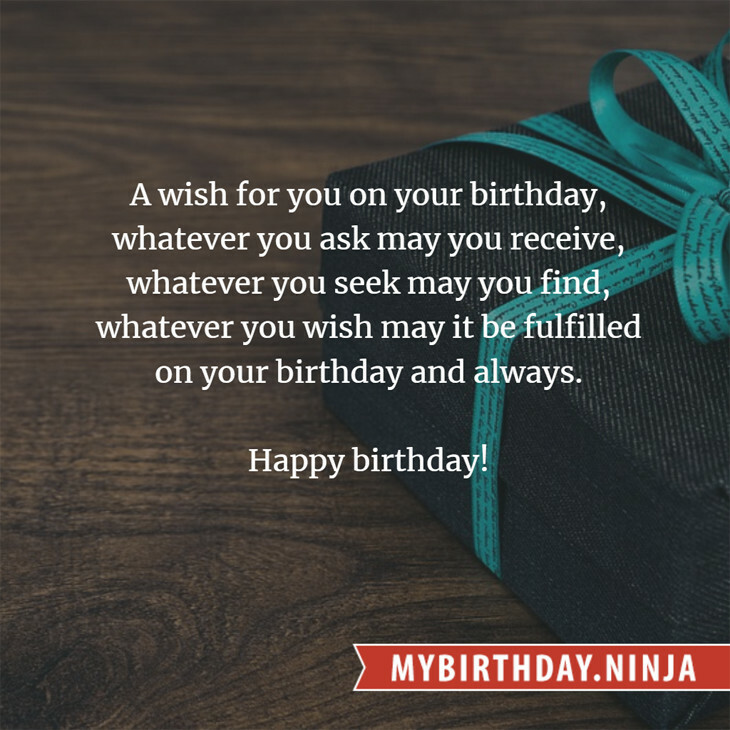 Your birthday numbers 10, 27, and 1951 reveal that your Life Path number is 8. It represents experience, authority and endeavour. You are gifted with natural leadership and the capacity to accumulate great wealth. The following celebrities also have the same life path number: Sherri Stoner, Ian Holm, Bernard Miles, Yvan Attal, Andrew Adamson, Larry Hagman, Conrad Veidt, Lawrence Leritz, Ted Cassidy, Mimi Fariña. 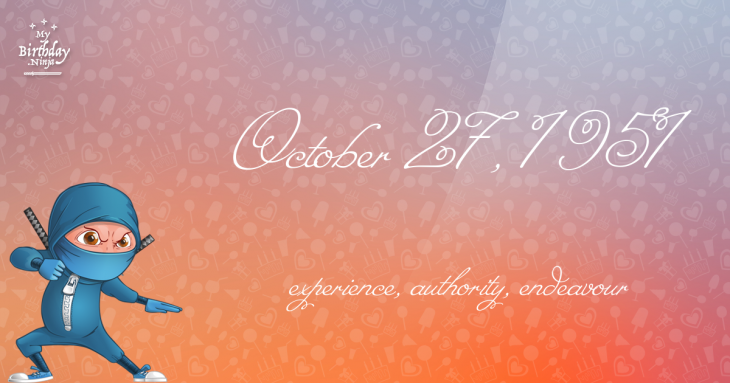 What is the birthday horoscope for Oct 27, 1951? The Western zodiac or sun sign of a person born on October 27 is Scorpio ♏ (The Scorpion) – a fixed sign with Water as Western element. The ruling planet is Pluto – the planet of transformation. According to the ancient art of Chinese astrology (or Eastern zodiac), Rabbit is the mythical animal and Metal is the Eastern element of a person born on October 27, 1951. Fun fact: The birth flower for 27th October 1951 is Cosmos for constancy. What is the Love Match for Oct 27, 1951? When it comes to love and relationship, you are most compatible with a person born on January 25, 1965. You have a Love Match compatibility score of +113. Imagine being in love with your soul mate. On the negative side, you are most incompatible with a person born on April 6, 1970. Your incompatibility score is -118. You’ll be like a cat and a dog on a love-hate relationship. Arf-arf, I want to bite you. Meow-meow, stay away from me! How many babies were born on October 27, 1951? Base on the data published by the United Nations Population Division, an estimated 97,382,033 babies were born throughout the world in the year 1951. The estimated number of babies born on 27th October 1951 is 266,800. That’s equivalent to 185 babies every minute. Try to imagine if all of them are crying at the same time. What is the popular baby name on 27 Oct 1951? Here’s a quick list of all the fun birthday facts about October 27, 1951. Celebrities, famous birthdays, historical events, and past life were excluded. Try another birth date of someone you know or try the birthday of these celebrities: September 10, 1970 – Ménélik, Cameroonian-French rapper; September 6, 1970 – Cheyne Coates, Australian singer-songwriter and producer (Madison Avenue); April 20, 1924 – Leslie Phillips, English actor and producer.